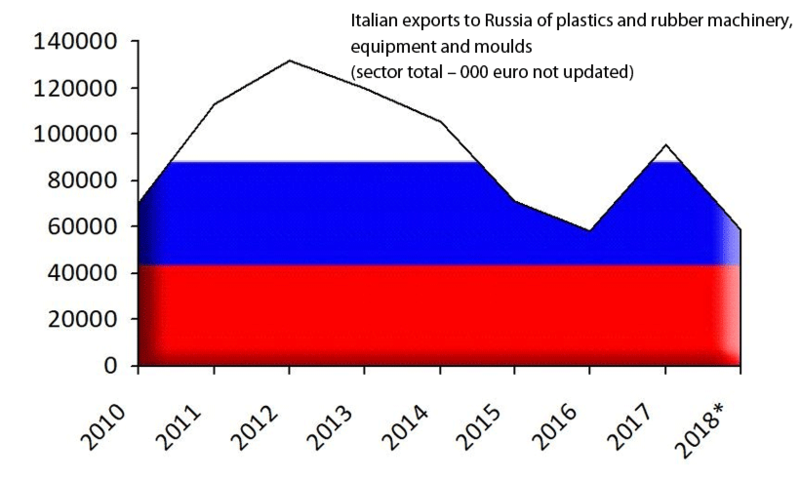 After the peak recorded in 2017, boosting hopes among Italian manufacturers of plastics and rubber processing machinery, equipment, and moulds, sales of technology to Russia in the first three quarters of 2018 have turned out to be sluggish. Analyses of ISTAT foreign trade data by the Statistical Studies Center of Amaplast (trade association within CONFINDUSTRIA including over 160 manufacturers) show that exports to Russia fell off by 19.6% with respect to the first nine months of 2017, with an aggregate value of just under 60 million euros. Russia thus slips from eleventh to twelfth place in export market rankings for the sector. However, assuming 2018 year-end data confirm this trend, the downturn is less accentuated than what we have seen in the cycles of the past decade. Extruders, flexographic printers, thermoforming machines, and moulds are the main “victims” of the slump, while blow-moulding machines, plants for mono/multifilament, and presses maintain an opposing trend. In virtue of the importance of the Russian market for Italian machinery manufacturers—partly as a bridge to other countries in the area—Amaplast is organizing and coordinating the traditional national pavilion of about forty Italian companies, which will occupy some 700 square metres of exhibition space at the 22nd specialized Interplastica fair (Moscow, 29 January–1 February 2019). Other Italian companies will participate independently or via the stands of their local agents or branches.The Italian pavilion is the second largest after that of the Germans, whose supplies to Russian converters have lost significant ground in recent years to Chinese competitors. Like Italian exports, after a certain recovery in 2017, German sales to Russia also witnessed a new setback in the first nine months of 2018. The following Amaplast member companies will be present in the Italian collective at Interplastica 2019: Amut, Bausano & Figli, BG Plast Impianti, BMB, Borghi, Caccia Engineering, CMG srl, CMS, Colines, Comac, Elba, Euroviti, FB Balzanelli, Friul Filiere, Gamma Meccanica, Gefit, Gimatic, IPM, Itib Machinery International, Maris, Moretto, MOSS, Negri Bossi, Olmas, OMMPMoulds, Polivinil Rotomachinery, Previero/Sorema, Profile Dies, Promixon, Sica, Tecnomatic, Tecnova, Termostampi. The Amaplast stand is n. C23 in Hall 2.3. The negative trend in sales to Russia is part of a general slowdown in Italian exports for the sector, which fell by 0.6% in the first three quarters of 2018 with respect to the same period in 2017, slipping a number of times into the negative zone by a few decimal points over the course of the year. However, what we are actually witnessing is a stabilization, which should not come as a great surprise and remains within the norm, after the strongly expansionary trend in the past 7–8 years (with the sole exception of 2013). While still showing double-digit growth (+11.4%), imports for the sector have slowed from the +26% and +23% recorded in March and June, respectively. The balance of trade, remaining strongly positive at 1.62 billion euros, shrank by five percentage points in the period in question.